Food and filter size calculations using your App on or offline! -How much food your Koi need at each water temperature. -How much food your Koi need, plus how big your filter should be, using your own settings for body weight %. -Available OFFLINE after installation, so no WIFI or Internet connection necessary. -The calculator stores your entry's on your device so only enter up to 100 Koi for the calculations once. -Adjust anything and the calculator instantly adjusts the results. -Inn- app adjustment for English, Dutch, French or German with the push of a button, and back if required. 1: How much food your Koi need at each water temperature. Enter how many Koi you have per length. Result is instantly shown: Gram food you should totally feed your Koi per day, plus an advised number of feedings this amount should given in each day. Calculation is based on average Koi body weights at each length. Select one or two filter materials in your biological filter and enter how much Liter or square meter you have. The result is instantly shown and indicates with a 25% safety margin how much food your total biological filter can handle per day. Enter the total protein % of the food you feed. Enter what % body weight you wish to use for the calculation for small, average or large Koi. Result is instantly shown: Gram food you should totally feed your Koi per day, plus an advised number of feedings this amount should be given in each day. We will regularly provide updates based on user experience to keep improving the app. This app is made by an experienced Koi hobbyist, for own use and to help the Koi hobby worldwide to give a good indication of starting points for beginning hobbyists, and to help experienced hobbyists to have an easy total calculation tool at hand, everywhere, even offline. For use to explain how big of filters should be purchased and installed (behind decent coarse filtration), and even to discuss body weight % to use per Koi length. The calculator is completely functional plus there will be extra functions available soon through in app purchases. 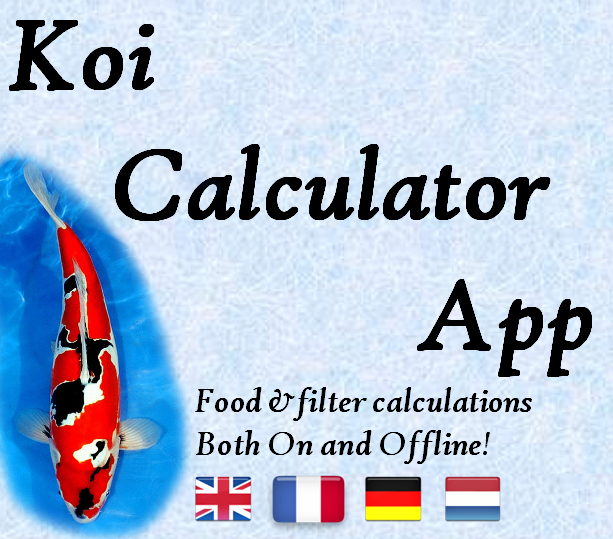 ​This Koi food and filter calculator has been made with the utmost care by a hobbyist, for Koi hobbyists worldwide to quickly get a good estimate of the required amount of food or filtersize needed. As no pond or filter is equal, and each food is composed slightly different, the data acquired from the Koi calculator can only be used as an indication. The calculations are made and based on data generally used and accepted in the Koi community and can be obtained freely on the www. the data from different sources was averaged to get the best consensus from numbers given by breeders and leading people in the industry. The app builders assume that filtersystems and koi pond maintanence by Koi calculator users, are adequate. The use of the Koi calculator and data acquired thereoff is completely at the own risk of its users. The owners and creators of the Koi calculator can never legally be held responsible, in which ever way possible, for, and by the use of the application, not the consequences thereoff. Do not change the amount advised by the calculator each day. One should slowly feed increasing amounts to reach the amount needed by adding approximately 50 gram to the total per day. If your koi do not eat the advised amount, discard the leftover during maximum one week, then seek help for your filter system or management is inadequate.